Goofus and Gallant is an educational comic that has appeared in Highlights for Children since 1948. It contrasts two boys, Goofus and Gallant. Gallant has good social skills and Goofus poor. 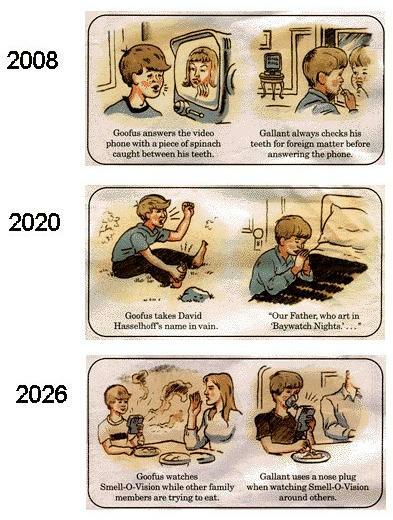 Here is a comic illustrating the two boys in a hilariously and increasingly dystopian 21st century. I had to break it into three pieces to get the picture to load properly. Here's part 2 and here's part 3. Fashion trends change on daily basis, like Gold GHD. Now Burberry Sunglasses.Our ED Hardy Sunglasses will definitely satisfy your taste. ED Hardy T-shirt chain makes people enjoy the cheap ED Hardy Clothing range easily our ED Hardy Outlet. As we all know, in fact discount ED Hardy, is based. The reason is simple: fashion prohibited by polo boots, in other words, we can say it as polo shoes. Would you like to wear cheap ugg boots? Now welcome to our paul smith outlet. And these are different products, like Puma Shoes (or you can say Puma Sneaker, and you can buy them from our puma outlet), GHD, ED Hardy, UGG, Paul Smith and brand Sunglasses. For those who desire for a ugg boots but have to refrain themselves from buying one ugg boots, there are some company that offer discount ugg boots. These days, I have known a very good online store for air force one shoes.Their shoes have wonderful quality and low price, almost factory outlet. I purchased my little nephew a pair of that shoes and buy one pair of five finger shoes.These goods are awesome and the store owner did a fast delivery, just taking 5 days. You guys should try to browse through it.